This is a very simple but sweet story about how the Bodhisatta was able to solve a dispute between two friends and restore harmony to their relationship. Notice the subtle point that when resolving the dispute, the Bodhisatta says that they are both right rather than that they are both wrong. After the Master heard what they had to say, he said, “Monks, in bygone days also, I answered this same question for you. But your previous existences have become confused in your minds.” (For the monks, events in previous existences became jumbled together so that no distinct memory remained. A Buddha has the power of remembering the whole of his past existences.) And so saying, he told this story of the past. 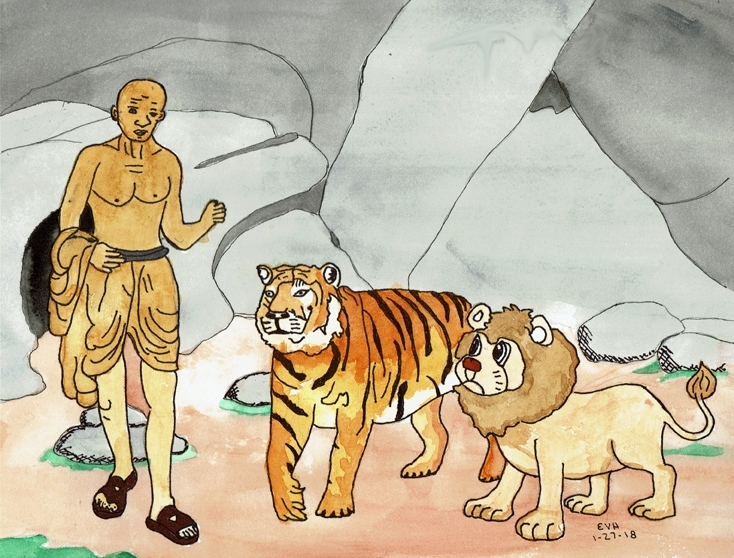 Once upon a time at the foot of a mountain, two friends, a lion and a tiger, were living together in the same cave. The Bodhisatta too was living at the foot of the same mountain as a hermit. Then it is cold. For cold is caused by wind. And, therefore, I decide you both are right. In this way the Bodhisatta made peace between those friends.